Mount Makalu (8485m/27,838ft) was first climbed by an American team led by William Siri in the spring of 1954. The expedition was composed of Sierra Club members including Allen Steck, William E. Long, and was called the California Himalayan Expedition to Makalu. They attempted the southeast ridge but were turned back at 7,100 m (23,300 ft) by a constant barrage of storms. A New Zealand team including Sir Edmund Hillary was also active in the spring, but did not get very high due to injury and illness. In the fall of 1954, a French reconnaissance expedition made the first ascents of the subsidiary summits Kangchungtse May 15, 1955 by Lionel Terray and Jean Couzy during a French expedition led by Jean Franco. The expedition was composed of Sierra Club members including Allen Steck, William E. Long, and was called the California Himalayan Expedition to Makalu. There was also a New Zealand team including Edmund Hillary that attempted the route but was turned back due to injury and illness. These were all major achievements especially considering that Makalu is such a difficult peak. The fifth highest mountain in the world Makalu is located in the Mahalangur Himalayas 19 km southeast of Mount Everest, in the border between Nepal and China. One of the eight-thousanders, Makalu is an isolated peak whose shape is a four-sided pyramid. The South East Ridge and the Northwest Ridgeare the main climbing routeson Mt. Makalu. The 8485m peak usually takes around 54 days to climb. 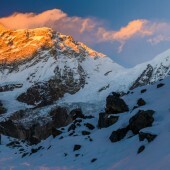 Most climbers are able to climb Makalu in both the spring and autumn seasons. However, spring is more suitable for good weather and snow conditions. It is located at the coordinatesof 27°53'21'' N and 87°05'27'' E. The approach to Makalu is beautiful and elegant, the Barun Valley provides stunning contrasts where high waterfalls cascade into deep gorges, craggy rocks rise from lush green forests, and colorful flowers bloom beneath white snow peaks. This unique landscape shelters some of the last pristine mountain ecosystems on earth. Rare species of animals and plants flourish in diverse climates and habitats, relatively undisturbed by human kind.With seven valleys radiating from Mt. Makalu and it’s almost symmetrical four ridges it presents an incredible symmetrical elegance. 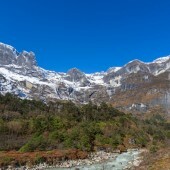 Within this wide range of altitudes and climates, the Makalu-Barun area contains some of the richest and most diverse flora and fauna of Nepal. Diverse ethnic communities of Rai, Sherpa, and Shingsawa have inhibited the lower parts of country. The climbing itself is appropriate for both the experienced climber and the novice climber making their first 8,000 meter peak ascent. The climbing consists of easy glaciers low on the mountain, steep ice and snow climbing to the Makalu La and above Camp IV a final rock ridge to the summit. Makalu is a steep and consistent climb, and in the spring season has excellent snow coverage and low hazards like icefalls, rock falling and avalanche. Satori Adventures utilizes oxygen above 7,200 meters and Sherpa support with fixed ropes throughout the climb.Each climbing day is reasonable in length and difficulty, However Satori Adventures will provide only Base Camp Servicesfor climbers who want to do the peak in an unsupported fashion. The other exciting aspect of climbing Makalu is the lack of crowds. While we expect to share the mountain with other teams, they will generally be small and strong. This gives us support on the mountain in establishing the route and ropes, but avoids any overcrowding common on other 8000-meter peaks. The trekking into the base camp and Makalu is an absolutely breathtaking and takes you back in time when all Himalayan mountains were approached on foot. After a 25 minute flight from Kathmandu to Tumlingtar the trek begins from a low elevation of 920m. Climbers have a great chance to acclimatizeas the trail goes through: Num (1800m), Sheduwa (1510m), Tashi Gaon (2070m),Khongma(3760m),Mumbuk (3550m),Yangri Kharka (3600m), Sherson (4800m) and finally Makalu base camp (4870m). It is the perfect way to acclimatize before base camp is reached and to take on climbing relatively quickly. Satori Adventures always follows a cautious acclimatization schedule we will utilize four camps on the mountain and use camp I and camp II for acclimatization purposes with us making a climb to 7000m before descending to advanced base camp in anticipation of a summit attempt. 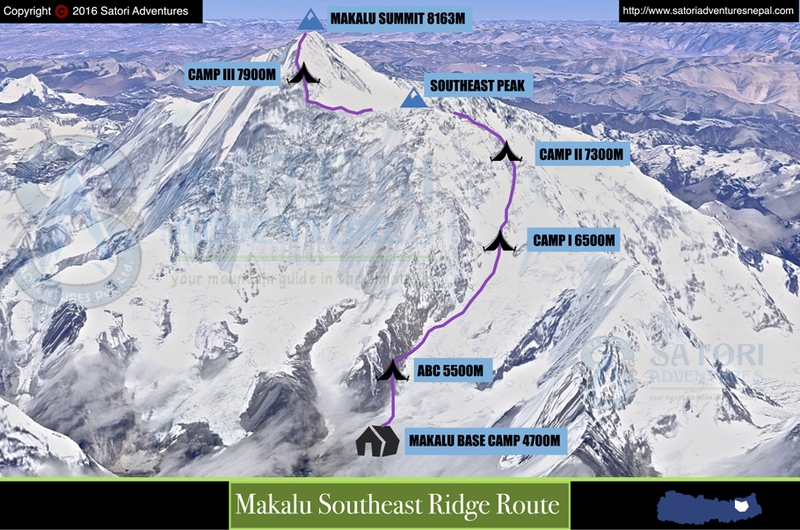 The summit push will go directly fromcamp IItocamp III on the Makalu La, we will then place camp IV to create a shorter summit day. Traditionally there is a very low base camp, abc camp at 5500m, C1 (6,500m), C2 (7,300m) at the bottom of the Southeast peak ridge and C3 (7,900m) and a high camp. Makalu Advanced base camp is located on a rocky moraine with amazing views of the Himalaya. Satori Adventures advance base camp will be setup for almost a one month period. On an 8000m expedition climbers spend most of their time at base camp, so naturally on any long expedition, base camp becomes a home away from home. We establish our camp at a walking distance between different groups and with a strategic view of the Makalu massif. Satori provides a personal tent which becomes your private retreat, a dining tent that is the common area, a shower tent and toilet tent. When you arrive at base camp it will already be fully established with hot beverages and snacksavailable immediately. Waiting for you there will be your base camp staff and high altitude climbing Sherpa. 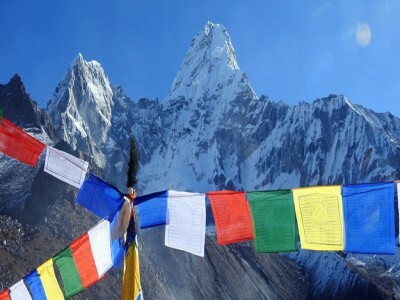 Prior to your climbing period you will have a Puja ceremony at the base camp for good luck. This is one Nepalese tradition not to miss, it represents safe climbing passage for everyone involved in the expedition. 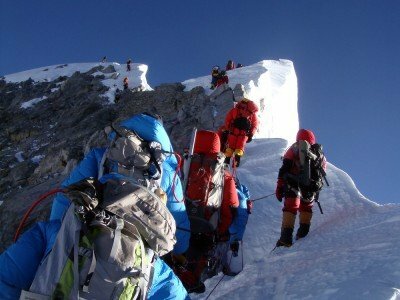 Once you have reviewed basic and advanced training by your climbing Sherpa guide, you will be ready for your attempt to climb to camp I which is at a height of 6400m/21,000ft. Prior to the first section of glacier you will encounter grassy slopes, rock slabs and moraine. Once on the glacier you will encounter mixed terrain including a few crevasses and 200m of blue ice. The first section of climbing on the moraine takes about an hour after that you reach the crampon point at the mouth of the glacier, the glacier portion takes about 2 hours. For average climbers it takes about 3-4 hours. Camp I is divided into two sections, lower camp I and upper camp I, the distance between the two is 100m/328ft. So camp 1 is fixed between 6400m-6500m. The climbing from camp I to camp II is considered the moderate technical section on Mt. Makalu. During this section you encounter the heart of ice and snow. The first section is slogging over snow for about an hour, and then you encounter several steep sections of ice, there are small sections of ice fall that do not require ladder. These sections can be crossed with the support of fixed ropes, a few big steps and some steep snow climbing. For most people this is the crux of the route. This section will take slow climbers about 2½-3 hours. Camp 2 is situated above the snowy terrace. The distance from camp II to camp III is the longest section of the route, it extends 600m/1,968ft. It does not require any ladder crossings, but there are a few crevasses that are roughly a half meter long that need to be jumped. The main ropes are fixed by a climbing Sherpa team. This section for most climbers feels easier, but still it is not to be taken lightly.The climbing is on sustained slopes and there is exposure to cold and wind. Although in spring there has been reports of direct sun hitting this section making it feel very warm. This is the camp that 40% of climbers plan to do their summit push from. However, Satori Adventures always fixes camp IV before the summit so that clients can get a half nights rest. This section takes about 4 hours for normal climbers and 5 hours for slower and first time 8000m climbers. Climbing from camp III to camp IV feels like a short day, the distance is short but now you are nearing the death zone. The oxygen levels are very low at this altitude so it is expected that any effort no matter how minimum or trivial will feel arduous. In this section you have to climb for 3 hours on steep snow that is on a 50º-55º slope. This section is little dangerous in the autumn season because the snow slope is covering a layer of ice which make the section avalanche prone. This is the reason Satori Adventures only operates in the spring season. Many consider the crux of t route to be the Seignior Wall which will be crossed here.Camp will be set up above right above Makalu la. Satori team makes an easy traverse to camp IV at 7900m which allows you to have a shorter summit day. The main goal during the climbing periodis the summit. Most climbers begin their summit bid at 11:00pm. If all goes well they reach the summit between 7-10am. Below the main summit is a false summit, the main summit is reached via an exposed ridge. It takes about 5 hours to return to Camp 4 from the summit and another 2 hours to get to camp three for overnight stay. The climbing is not technical in the early part as you ascend through several basins with short snow headwalls. The climb passes the false summit and finishes on an exposed ridge to the true summit for a spectacular view of the mighty Himalaya. Satori Adventures Sherpa guides will fix ropes, break trail and make every effort to assist the group to reach the summit of the 5th highest mountain in the world. 4-5 April/Day2-3: Preparation and briefings at the Departments of Tourism. Last minute shopping. 06 April/Day 04: Fly from Kathmandu to Tumlingtar. 50 min Drive to Num (1980m/6,496ft)6-7hrs. Lodge/camping accommodation. 07 April/Day 05: Trek from Num to Seduwa (1500m/4,922ft) 6-7 hrs Lodge/camping accommodation. 08 April/Day 06: Trek from Seduwa to Tashigaoun(2100m/6,890ft) 6-7hrs. Lodge/camping accommodation. 09 April/Day 07: Trek from Tashigaoun to Khongma Danda(3500m/11483ft) 6-7hrs. Lodge/camping accommodation. 10 April/Day 08: Exploration and Acclimatization day at Khongma(3500m/11,483ft) 06-07hrs. Lodge accommodation. 11 April/Day 09: Trek from Khongma to Dobsto (3650m/11,975ft) 6-7hrs. Lodge/camping accommodation. 12 April/Day 10: Trek from Dobute to Yangle Kharka (3600m/11,811ft) 6-7hrs. Lodge/camping accommodation. 13 April/Day 11: Trek from Yangle Kharka to Langmale Kharka (4410m/14469ft) 6-7 hrs. Lodge/camping accommodation. 17 April/Day 15: Trek from Hillary base camp to Advance base Camp (5600m/18,373ft) 5 hrs. 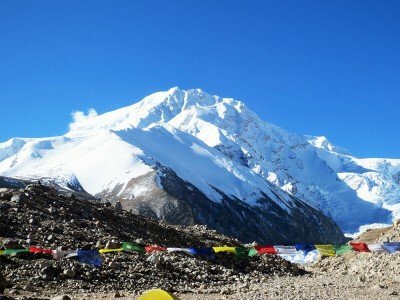 26 May/Day 54: Trek from Advance Base Camp to Yangli Kharka (3600m/11,811ft) 6-7hrs. Lodge/camping accommodation. 27 May/Day 55: Trek from Yangli Kharka to Dobato (3650m/11,975ft) 6-7 hrs. Lodge/camping accommodation. 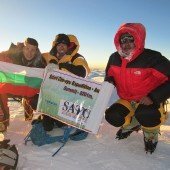 28 May/Day 56: Trek from Dobute to Khongma (3500m/11,483ft) 6-7 hrs. Lodge/camping accommodation. 30 May/Day 58: Trek from Seduwa to Num (1980m/6,496ft) 6-7 hrs. Lodge/camping accommodation. 31 May/Day 59: Drive from Num to Tumlingtar. 4 hrs Lodge accommodation. Satori Adventures offers Full Board Service for our entire range of flagship mountaineering expeditions to all 8000m peaks. Full Board service means that we will provide a Trekking service, base camp service and high camp service executed by your Sherpa climbing guide. All of our full board clients will have a personal Sherpa climbing guide exclusively dedicated to the client for the duration of the climb. Our climbing Sherpa guide team will establish and secure climbing route in collaboration with other climbing teams participating on the route. Establish all high camps with camping equipment, provisions, oxygen and prepare high altitude food for the client. Full board also includesassistingthe client on the route while ensuringtheir safety and wellbeing.We move at the clients preferred pace andensure total commitment to the client in case of emergency with the clients safety and wellbeing being the overriding priority. High camp service for the Full Board Service will consist of all of the equipment necessary to fix the route, all camping equipment, fuel and food for high camps as well as oxygen provision, including mask and regulator and latest model of Poisk oxygen and Summit system mask regulators. Satellite phone carrying by guide for communication and available for members at a cost of$3USD per minute. Schedule flight tickets for Kathmandu-Tumlingtar-Kathmandu to all the climbing members, Sherpa guide, liaison officer and kitchen staff. 40kg baggage allowance per person during the trekking to base camp which will be carried by porter. Equipment allowances and wages for chefs, kitchen assistants. Satellite phone carried by guide for communication. Available to clients at a cost of $3USD per minute. Tent above base camp (except camp II). Why climb with Satori Adventures in Makalu? The approach on its south side is through the Barun region of Nepal leading up to Sarsing Kharka Glacier. It starts with the flight to Tumlingtar and the trek via Num (1980m/6,496ft), Seduwa (1500m/4,922ft) , Tashigaoun(2100m/6,890ft), Khongma Danda(3500m/11483ft) ,Dobsto (3650m/11,975ft),Yangle Kharka (3600m/11,811ft), Langmale Kharka (4410m/14469ft), Makalu Base Camp (5018m/16,464ft) to Advance base Camp (5600m/18,373ft). It takes typically 12 days to reach ABC from Kathmandu. 1849: Makalu was registered by Indian Topographical expedition as Peak XIII. 1921: Topographical expedition leaded by Howard Burey made the description of the Makalu region and took pictures of the summit. 1951:A group of Britains Everest Committee led by Eric Shenton located the routes on theSouth face. 1954: First attempts of ascents: American mountaineers leaded by W. Seyra climbed up to 7100 m via the Southern ridge. Britain mountaineers reached 6 500 m in the direction to the North col.
First Ascent 1955: May15th Jan Cusi and Leonel Terrey summitted Makalu via the North col.
1970: Japanese mountaineers Ch. Takanaka and I. Otsaki climbed the South-East ridge of Makalu. T1973: Makalu, South face was climbed. (Czech expedition, leaded by Ivan Galfi). 1976: Makalu, South-West face was climbed via the buttress (Czech expedition, leaded by Ivan Galfi). Climbers that reached the summited included: M. Krissak , K. Shubert and Spaniard J. Kamprubi. 1981: (autumn) After the unsuccessful attempt to climb the West face Kukuchka successfully soloed the North-West buttress. 1990: (spring) For the first time a woman climbed the West ridge as a member of an American expedition, via one of the most difficult routes up the peak. Kitty Kalon-Griss and Jott Chat reached the summit on the 18th of May, from an altitude of 7800m. 1997: The West face was successfully summited. The Russian expedition to the West Face of Makalu, lead by Sergey Efimov climbed to the top on 21st of May via the most difficult route. The last part of the route went on Parago ridge. Summiteers included: Alexei Bolotov, Yuri Ermachek, Dmitri Pavlenko, Igor Bugachevski and Nikolai Jiline. For this ascent they were awarded the "Golden ice-axe". 2001: Sherpa Lhakpa Dorje became the first climber in history to summit Makalu twice. 2009: On February 9th, Italian Simone Moro and Kazakh Denis Urubko became the first people to make a successful winter ascent of Makalu. This was the final Nepali 8000 meter peak to be climbed in the winter.